Employee State Insurance (ESI) is a type of insurance scheme that addresses Indian employees whose gross wage is INR 15000 or lesser. Employee contributes 1.75% and Employer contributs 4.75 of the monthly gross wage. Question 1: When an employee receives an increment, can the Employer stop ESI deductions and contributions from that month onwards? The answer is “No”. In the scheme of ESI, the whole financial year is split into two blocks – April to September and October to March. When an employee has contributed to ESI atleast once in a block, the employee must continue to contribute to ESI for the rest of the block. Lets say, someone receives an increment, from 1-June onwards, that bumps their ESI gross from 14000 to 17000. Since the employee has contributed to ESI in April and May, he/she must continue to contribute to ESI until September. Question 2: In that case, what is the wage based on which ESI should be calculated? There is a common misconception that when ESI gross for an employee exceeds 15000 (the limit set by govt and revised from time to time), ESI deductions should be based on the limit. No, ESI should be deducted on the actual ESI gross regardless of the limit. Going back to the example above, the employee’s ESI deduction in June will be 1.75% of 17000 and not 1.75% of 15000. How is this handled in PeopleSoft’s Global Payroll for India? ESI deduction is based on Generation control ESI GC ENROLL, which is based on ESI FM ENROLL GC. I have re-produced the formula and left a few comments also. Lines 5 through 36 handle block 1, while lines 37 and later handle block 2. Look out for AC[ESI_FYTDA] on line 27. Anytime that accumulator is greater than zero, the generation control turns true. Similarly, look out for the historical rule HR[ESI HR 2ND SEG]. The historical rule computes total of ESI deductions made in block 2 (October to March). Anytime it turns out non-zero, the generation control is set to true. Traditionally, a PS_HOME contained both PeopleTools and Application related files. This meant that you had to maintain four different PS_HOME folders for each of you DEV, TST, QA and PROD environments. For customers that use more than one PeopleSoft application (and there are many many), the number of PS_HOMEs multiply and get un-manageable at some point in time. PeopleTools 8.52 introduces PS_APP_HOME which co-exists with a PS_HOME, ofcourse along with the PS_CFG_HOME. That sounds like a lot of HOMEs 😉 What does each of these contain? Simply put, PS_HOME – contains all that your PeopleTools CDs offer, while PS_APP_HOME contains all that your application and language media packs offer. PS_CFG_HOME contains all your application server and process scheduler domain configuration fules. I personally think that the separation offered by PS_HOME and PS_APP_HOME reduces a lot of administration overhead. And a lot of space too. The separation also tremendously streamlines the application of peopletools patches and promises a shorter time-to-production. Just that you need to ensure you set PS_APP_HOME to the appropriate environment (DEV/QA etc) before invoking PSADMIN. You would also need to enlist both PS_HOME and PS_APP_HOME in your process scheduler for SQR files, because DDDAUDIT would come from PS_HOME and PER010 from you HR PS_APP_HOME. Every DBA evolves his/her own style over a period of time. They build handy scripts to carry out each and every activity in the database, including monitoring jobs, gathering tablespace information etc etc. Here is one particular script that I use to gather free/utilized space information on tablespaces. Hope it will be useful for you. Comments are most welcome. PeopleSoft’s Data Archive Manager offers an excellent framework for building archival scenarios. Due to its nativity, Data Archive Manager intuitively understands relationship between tables while creating scripts to archive data. There is no compromise on data integrity and no data is lost while archiving. 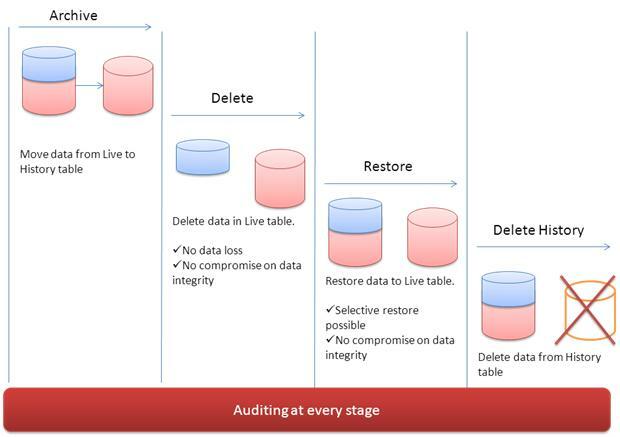 By design, Data Archive Manager offers seamless archive and restore options. Personally, I like the fact that at every stage in the process, Data Archive Manager audits the data moved back and forth to a row-count level of accuracy. And oh, did I mention that Data Archive Manager is bundled along with PeopleSoft, so you don’t have to buy expensive licenses to third-party tools for managing your PeopleSoft data.